Larkin and his colleagues get ready for the challenge. KILKENNY’S EOIN LARKIN is currently based in Syria where he is on duty with the Irish Defence Forces as part of their UN peace-keeping mission. However, after being challenged by his team-mate Paul Murphy to take part in the ‘Hurling Bin Challenge’ — an initiative to raise funds for the Make a Wish Foundation — Larkin took some time out of his schedule to set up the most elaborate challenge yet. If video doesn’t play, click here. 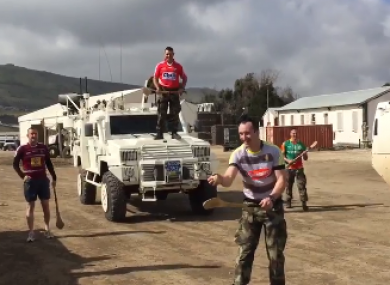 Email “Kilkenny's Larkin doesn't let Syrian secondment stop him nailing the 'Hurling Bin Challenge'”. Feedback on “Kilkenny's Larkin doesn't let Syrian secondment stop him nailing the 'Hurling Bin Challenge'”.